Shipping World Wide from New Zealand. An awesome overview of The Lord Of The Rings and The Hobbit film locations in New Zealand. Daniel Falconer's beautiful map covers the length and breadth of New Zealand and pinpoints how Tolkien and Peter Jackson's Middle-earth transplants to the geography of New Zealand. And as you can see, pretty much the whole country was used. This is the new and updated version of this map; twice the size of the original. 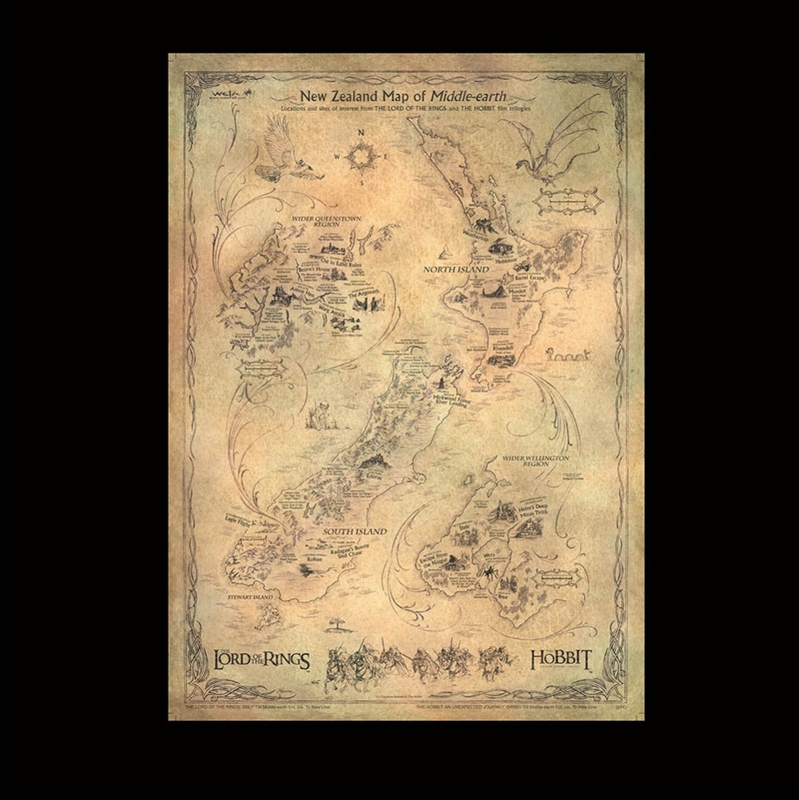 It now includes the locations and sites of interest of The Hobbit trilogy as well and is packed full of details. The size of the art print is B2 (20in x 28in | 500mm x 700 mm), it's printed on nice heavy stock and it ships rolled up and protected in a cardboard tube. Weathertop in the far North is on the map, as is the Lonely Mountain on the central plateau and Trollshaw Forest in Waikato. The river Anduin flows through the Rangitikei Gorge, and if you fancy following in the paw prints of Radagast's Rhosgobel Rabbits, the map shows you the way to Hartfield. Even if you want to re-imagine the Great Eagles' flight over the Sutherland Falls, you will never be lost with this map.